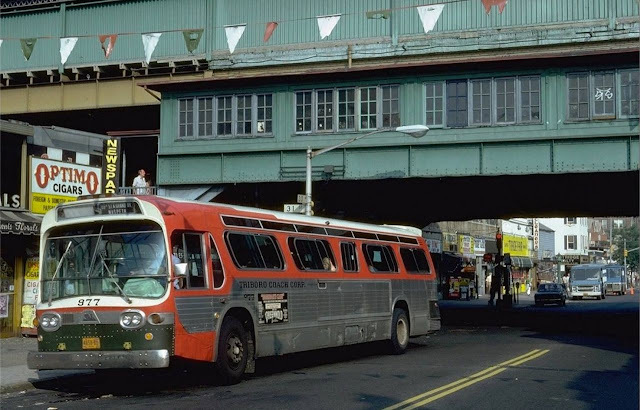 30th Ave and 31st St, Astoria, Queens, New York City, 1981. The "outer boroughs" of New York City don't usually get a lot of love when looking at the New York City of the past. Above is a street scene in 1981 of 30th Avenue at 31st Street, showing the station for the N/W trains. I decided to compare 30th Avenue at 31st Street in Astoria, Queens from 1981 to 2018. I used Google Street View of the exact same location. The essentials are the same - the elevated railway, the street and store layouts, even apparently the floral shop in front of the bus - but there is one key difference that intrigues me. Notice the Optimo Cigars sign on the left behind the bus (which itself is interesting for being so vintage). That is known in the business as a "Privilege Sign." Privilege signs are given out by major manufacturers to stores to push their products. The signs were called "privilege" because, while they always named the manufacturer's product and served as a form of advertising, the store owner (who got the sign for free) could usually add some of their own products to it. The privilege signs supplied by the Optimo Cigar Company were everywhere in New York back in the day. Optimo was founded by Antonio Santaella, who was originally from Andalucia, Spain and became a cigar maker in Cuba during the 1870s. In 1886, Santaella went to Chicago, Illinois to open a factory. There he produced many popular brands of cigars. These included Optimo, Marquette Club, Reformador, and Flor de Cervera. Optimo was the favorite cigar brand of Babe Ruth, among other celebrities, and apparently was the company's favorite offering overall. The Optimo Cigar Company prospered in the 1950s and began providing Privilege Signs. The Optimo Cigar Company is still very much around, and in fact apparently is doing quite well in the midst of a sort of mini-renaissance of cigar smoking. However, it appears to have gone out of the "free sign" business. 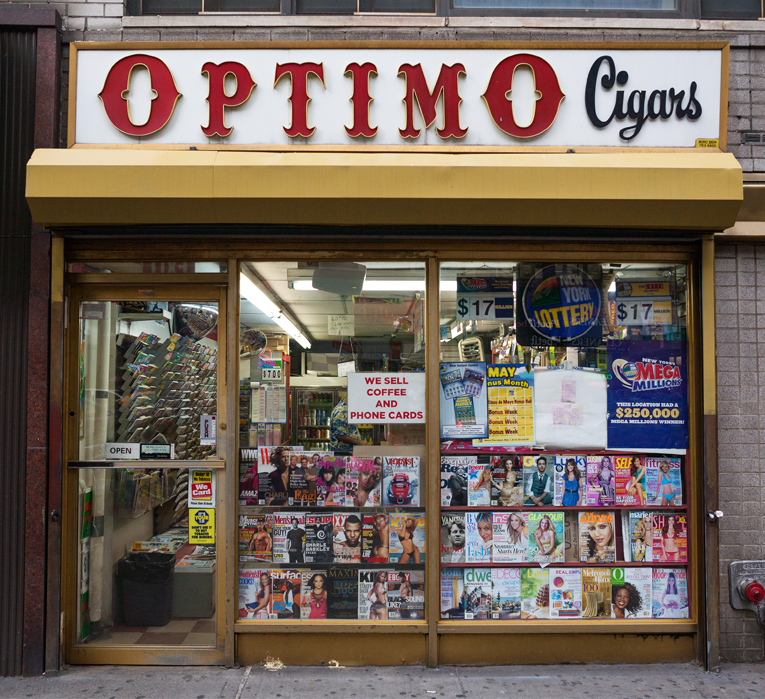 An Optimo Cigars newsstand on 14th Street in Manhattan. Some small establishments like this simply called themselves "Optimo Cigars Newsstand" or some variation of that to take advantage of the free sign. Anyway, the Optimo Cigars signs are fading away, as did the one at 30th Avenue in Astoria. They used to be everywhere - you couldn't walk a block in many neighborhoods without seeing one somewhere - but now there aren't nearly as many. The street corner is still the same, and while there isn't an Optimo sign there - the store itself is still a typical streetcorner place selling the same sorts of products. This is another in my series of "the more things change, the more they stay the same" posts. I hope you like them! 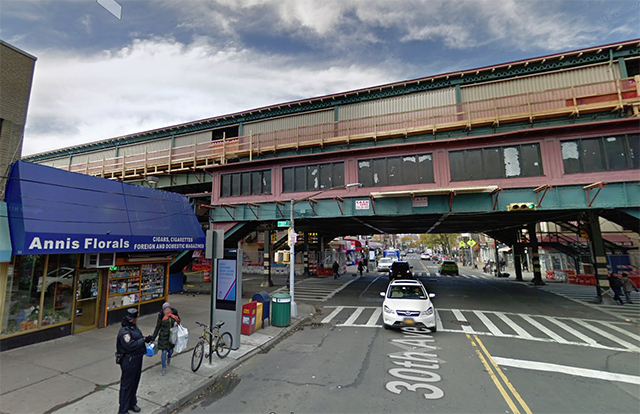 30th Avenue and 31st Street, Astoria, Queens on Google Street View in 2018 (Google Street View).